Happy Halloween from our little Hot Dogs! Lilly is on the left in both pics, Addy on the right. Seriously, this is way too much fun! We won't be trick or treating this year, but I couldn't pass on the costumes for their first Halloween. This will also probably be the only year they let me dress them alike! Thanks to Janet & Tony for their Halloween outfits and Becky for their first pumpkins! As for mom, I return to work part-time tomorrow, so I'm looking for a treat (maybe 6 hours of sleep??) tonight! October 19th brought another friend into the world--Claire Elizabeth Baxter was born to Rachel & Brogan Baxter. Whenever I talk about Rachel, I have to tell you that she was the first person to ever sit down next to me and my sister, the "new kids in school" during our first day at Terre Haute South. We became fast friends and I have a feeling Claire, Addy & Lilly will too! 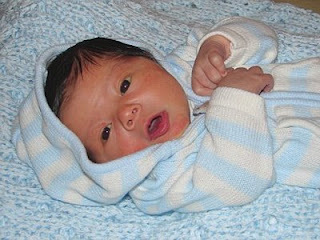 I think the last baby to arrive in my group of friends is Baby Jack Watko (due late Nov.), he will round out the year. I'm sure I echo Gretchen & Paul's feelings when I say we are ready to welcome him into the world--hang in their Gretchen! We went to our 2 1/2 month doctor's appointments and the doctor was pleased at how much the girls have grown! Addison has grown from her birth weight of 4 lbs 5 oz to a whopping 10 lbs 15 oz while her big sister Lillian has gone from 4 lbs 15 oz to 11 lbs 8 oz. They had all of their vaccines and it was traumatic, but I'm sure more traumatic for me and dad than for them! Jeremy kept his eyes closed as he held Ms. Lilly. They are beginning to like bathtime more and more and it is probably my favorite time with them. I can't wait until they can sit on their own and splash around! Here is my favorite pic (notice how the duck is strategically placed!) Their eyes aren't normally this big, but it is funny to see how much they look alike in this pic. I actually want to make a plug for the website http://www.gabbybaby.com/, these baby clothes are hilarious and originated from a mom that was sick and tired of the ridiculous things people asked her. My favorite is the "Don't touch my hands, I put them in my mouth" onsie. Well, we did it, we broke out. Last Saturday night was the night...we left the babies in the care of Grandpa and Grandma Ash and Grandma Linda. We alligned the troops and never looked back. And by never looking back, I mean I called about every 2 hours and drank through the anxiety of leaving the babies for the first time! We attended the wedding of Ben & Kristin Livermore in Chicago and it was wonderful to see them married and see friends, but difficult to stay away. We left early in the morning to get back to see the girls! But, seriously when they wake up at 4 in the morning and they won't go back in the crib, what are exhausted parents supposed to do??? We also don't strap the girls into their bouncy seats, because they hate being confined, so here is their personalities shining through again, Lilly is a little lazy right now and sleeps A LOT, Addy is wide awake most of the day, she loves her dad's IU mobile--Go Hoosiers! Here's a better look at Lilly--Grandma Jody calls her our Buddha Baby...It's a tough life, huh? So, life is good, but exhausting. Parents always say you never realized you can love so much and it has been true, I feel like I fall more in love with these girls more everyday! I'm delayed in welcoming Chase Palsky into the world. Christina is an OLD friend of mine, (blog linked on the right). Our families vacationed together when we were young and we attended countless Sunday school classes together. I also can speak for her maternal instincts because we played house together so often--she's going to be a great mom! So, there is irony that we enter the world of motherhood so close together! Chase was born on 9/27/07. I can't wait to meet you Chase! Next, in the year of the babies came Audrey Katherine Spice. 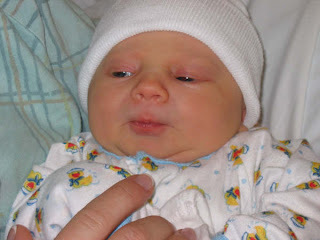 Audrey arrived on October 11th, so she is exactly 2 months younger than Addy & Lilly. Amanda and I went to high school together and were sorority sisters at Butler. I visited her last night at the hospital and Mom & baby are doing well! Congrats Amanda & Jarrod! So, to quote my father-in-law, "Your friends sure are fertile!" Yes, yes they are, but atleast I can rest easy and know that Addy and Lilly have so many friends before they even realize it! When Grandpa & Grandma Sadler are here, we like to walk around the neighborhood--but no stroller for us, we'd rather be cuddled while we walk! Lilly likes her swing only sporadically, here she is after a feeding, looking a little drunk! Addy LOVES this mirror from Grandpa Ian, she's facinated with herself. Funny that we've spent hundreds of dollars on chairs & swings & strollers, but she is most content with a 10 buck mirror! It isn't often we sleep, but we like to sleep most cuddling with visitors. Here is Lilly and Grandpa Ash! So, the question is, can you spoil babies, because ours seem to be slightly spoiled and know exactly how to get what they want! Road trip @ 8 weeks old! Okay, so Aunt Cat needs a baby picture fix, so here it is (please notice clothes & shoes!). Today we went to Muncie so that everyone I work with at Ball State could admire the little munchkins. They were really good in the car and perfect angels around my students. They are awake more and more during the day and we are having fun as they are recognizing themselves in mirrors and reacting when you talk to them. Bathtime is by far my favorite time as they still throw fits, but it is quite amusing. I'll have to post pictures of this another time! Here is one of my students Ashley hanging out with the twins.